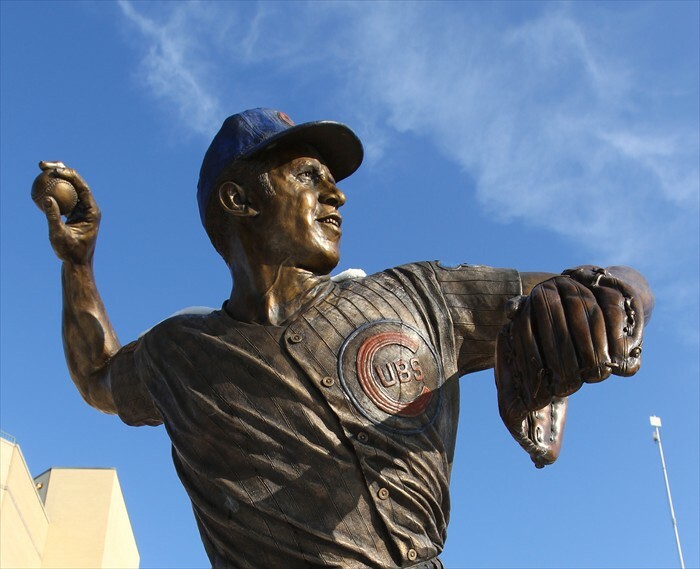 Thursday, I was in Mesa wearing a tee shirt and shorts, enjoying 70 degree weather and getting ready for my first trip to Cubs Convention in Chicago. Allegiant Air flies direct from the Phoenix-Mesa Gateway Airport which is close to my house to Rockford, IL which is somewhat close to Chicago. At the late date I purchased tickets Allegiant was substantially cheaper than flying into Chicago. I figured, it was no big deal driving the roughly 90 miles to the Windy City – besides, I know O’Hare can often be a pain. Friends in Chicago had been telling me how mild the winter was this year. “Was”, being the key word. What ensued after my flight arrived an hour late to Rockford at 8:30pm was a white knuckle drive on slick snow and ice covered roads that took nearly 3 hours. The journey included two cars spinning out completely (both on my side of the I-90), one ended up going sideways in front of me and the other ended facing me and the rest of oncoming traffic. Let’s just say I was extremely happy to make it to Chicago unscathed at 11:30pm. 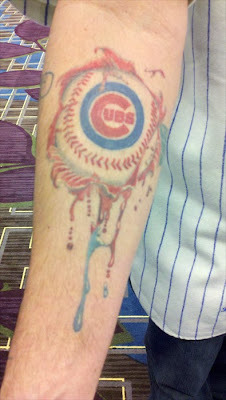 When I became a Cubs fan I didn’t know that meant occasionally putting your life on the line for the team! Upon entering the Hilton for Cubs Convention I found out first-time attendees must get in the Cubs Ink line, to be tattooed in Cubs blue. 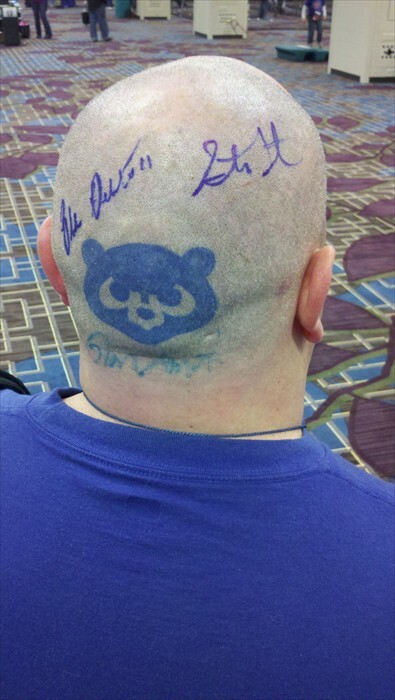 So glad body autographs were optional. 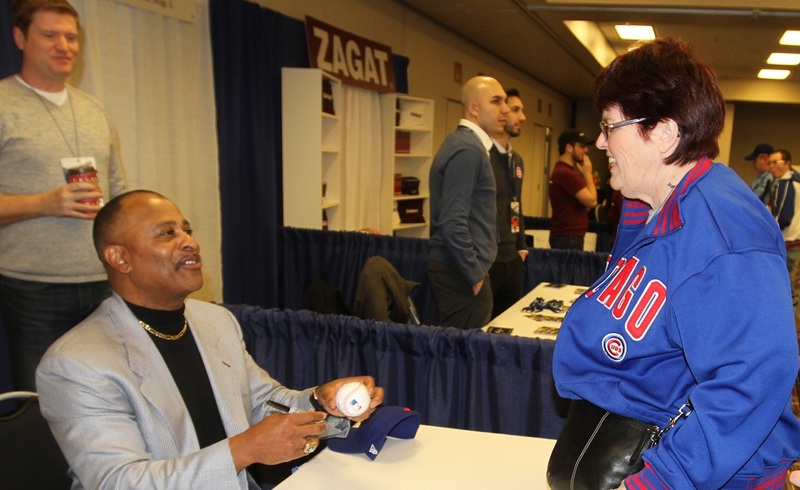 Tim O’Riley of Wrigleyville Magazine invited me to come and hang out at their booth, which was fantastic as I was able to meet many die-hard Cubs fans! 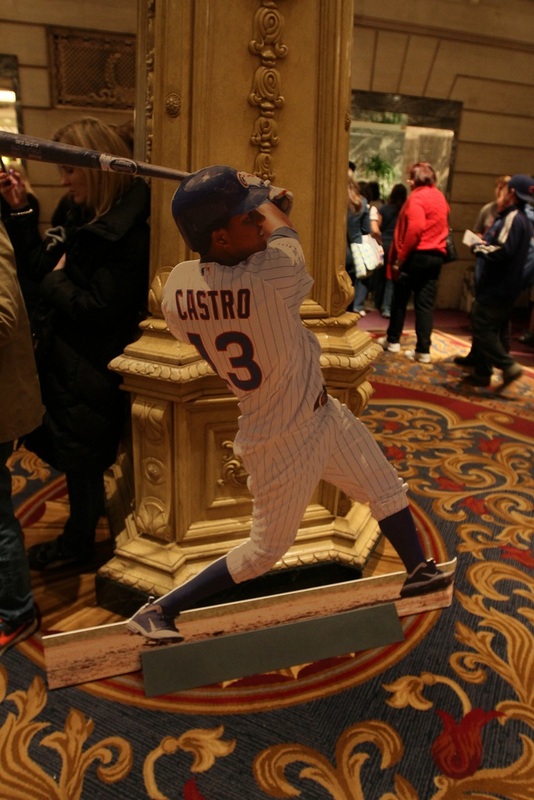 At the Cubs Convention it was amazing to me how many things are going on at any given time. 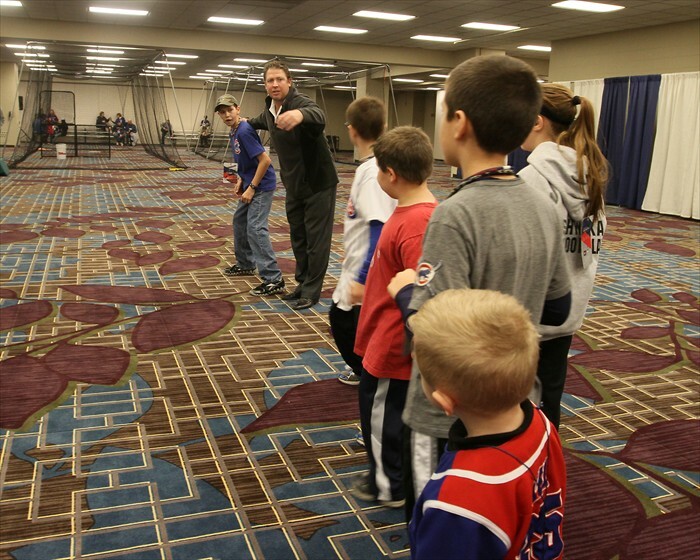 There were seminars/talks, autographs, exhibits, ceremonies, current and former Cubs players teaching kids baseball techniques, a kids Lego area and video gaming station, all spread out everywhere in the Hilton. 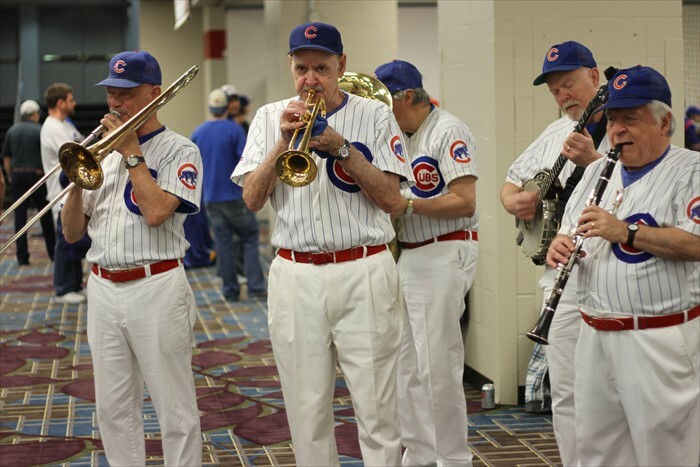 Combine that with a roving band and Wrigley Field organist Gary Pressy playing in his inimitable style and you truly have a Cubs spectacle. 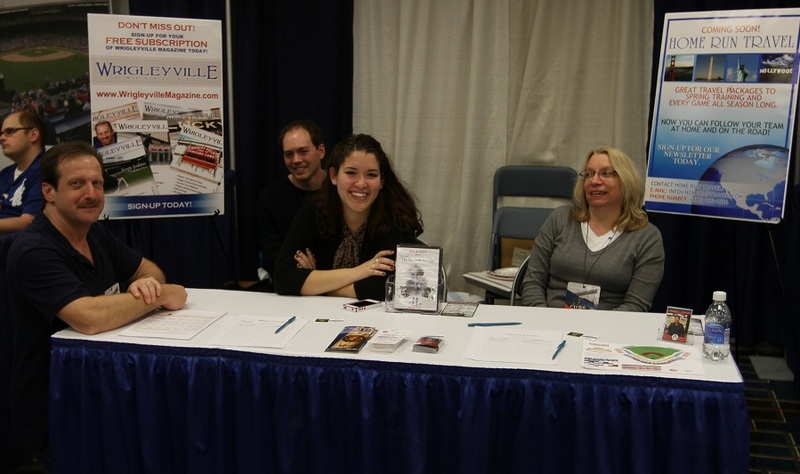 By spending a lot of time at the Wrigleyville Magazine booth I didn’t get to as many of the events/seminars as I would have liked. I did catch the opening ceremonies, and parts of “From the Field to the Booth”, “The Scouting Formula”, and “The Father-Son Connection”. For some great run-downs and details of what was said in these and many other Cubs Convention seminars stop by Chicago Cubs Online and Bleed Cubbie Blue. I enjoy reading these two outstanding websites and I have gotten to know the owners/creators of each, Neil Finnell of CCO and Al Yellon of BCB. Both Neil and Al stopped by the booth during the weekend to chat some Cubs and say hello. I also want to give a shout to the guys in the Quad Cities at IvyEnvy who were giving Boys of Spring some retweets during the weekend over on Twitter. There was a ton of great information in these seminars including how the new management is going to proceed in running the Cubs organization, so check out CCO and BCB for the scoop. 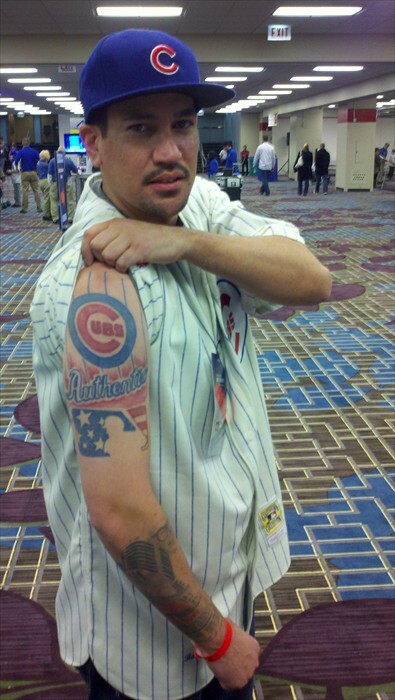 It’s need to know info for Cubs fans. With that said, since this was my first Cubs Con I wanted to get a feel for everything that was going on. What follows is a kind of photo essay of some of the weekend’s festivities and what I saw and did at Cubs Con and my time in the Windy City. 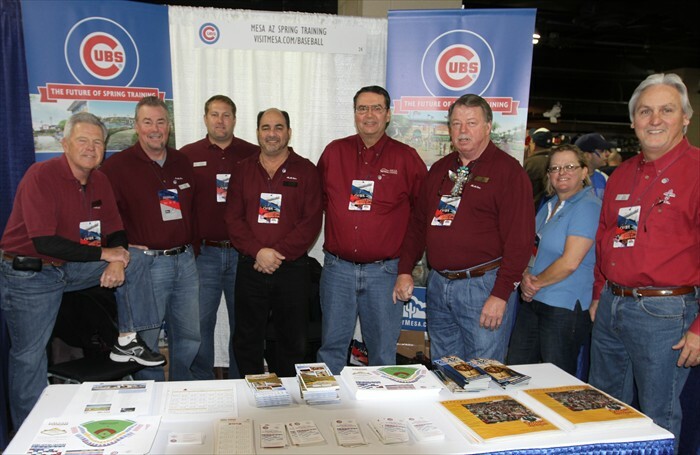 At Cubs Con I had the chance to talk with many Cubs friends and acquaintances I’ve met over the years, including former long time public address voice at Wrigley Field, Wayne Messmer. Wayne who often sings the National Anthem at Wrigley opened the ceremonies on Friday with his usual dynamic style and voice. For much of the weekend I could hear the music of Wrigley Field organist Gary Pressy who was across the room from our booth. I asked Gary what his favorite songs to play at Wrigley were, he mentioned Take Me Out to the Ball Game and Hey Hey Holy Mackerel (the 1969 Cubs fight song). 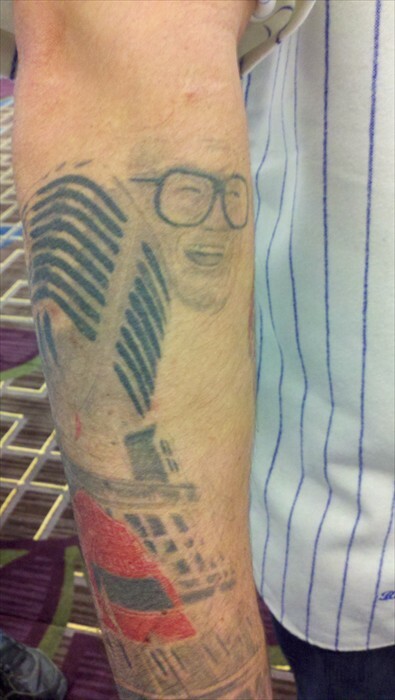 His favorite non-baseball song to play at Wrigley is Sweet Home Chicago. Talked with Cubs photographer Stephen Green. Stephen said he may be spending more time in AZ during spring training this year with so many new players. This coming 2012 season will be his 30th year as the Cubs photographer. Ran into my old pal and former Sun-Times Quick Hits sports columnist Elliott Harris. 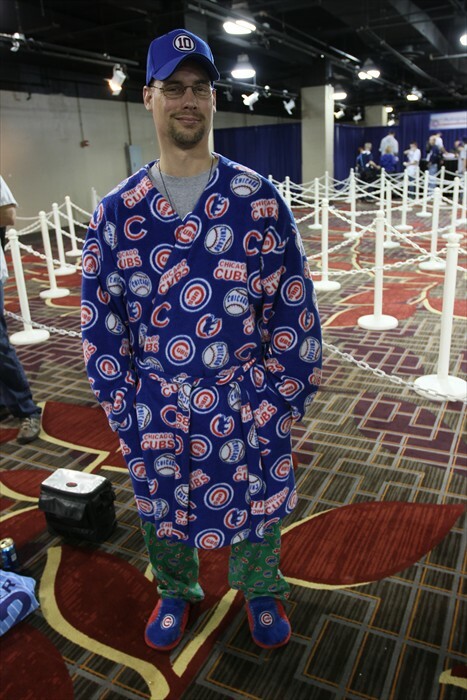 He says there is something appropriate about having Cubs Convention in the cold of Chicago winter. 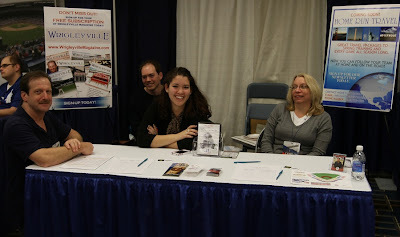 Since leaving the Sun Times Elliott has continued to write his own column on his website – ElliottHarris.com. Elliott also hosts the Sports & Torts show and really is living every guy’s dream as he meets beautiful ladies and talks sports. He did mention it’s still an adjustment not having the weekly newspaper paycheck, life does have it’s trade-offs. 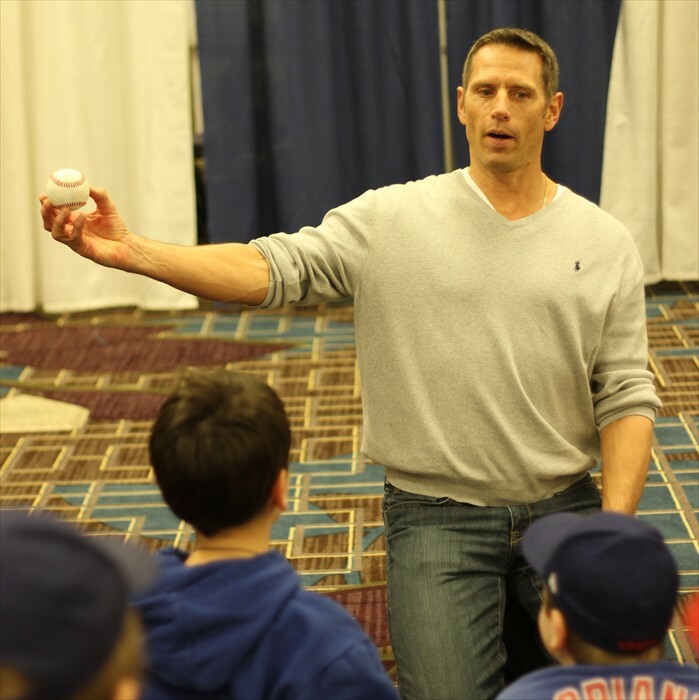 Was able to chat with Cubs Strength and Conditioning Coordinator Tim Buss who was excited about the new direction the organization is headed. Tim has been working with many players down in Mesa since November getting ready for the upcoming season. In a Chicago Tribune article Paul Sullivan called the off-season work-outs in Mesa ‘Camp Bussie’ and ‘Camp Campana’, now that Tyler ‘Camp’ Colvin is gone. Campana has gained about 10 pounds of muscle over the off-season. Having watched Tony and the guys run last week in AZ, I’m estimating the speedy Campana at about 173 lbs. My friends the Mesa Hohokams and Mesa Convention and Visitors Bureau had a booth promoting spring training and the new Cubs complex which will be ready for spring training in 2014. The Hohokams have been helping and promoting spring training in Arizona since 1952. 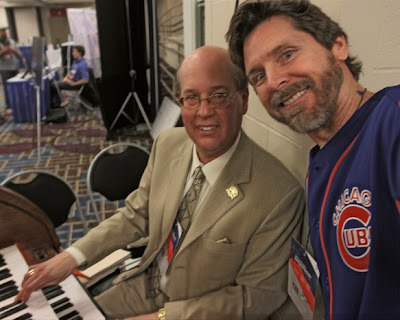 I had a chance to chat with Cubs radio man extraordinaire Pat Hughes who was a big part of the convention handling many duties, including the opening ceremonies. 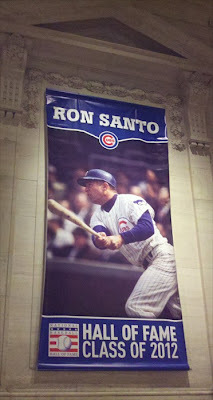 Pat and his two daughters had a booth selling his book Ron Santo A Perfect 10 and Pat’s Baseball Voices CD’s. Like Bussie, Pat is very positive about what is going on with the direction of the organization. Someone I had known about but never met until this weekend was Cubs unofficial historian and Vine Line writer Ed Hartig. I have read his name many times in articles and publications for his research; so it was nice to finally put a face to the name. 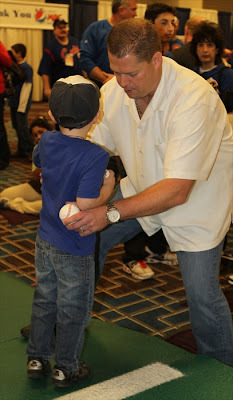 Kerry Wood signed autographs for an hour and 15 minutes after his time was up, until all those in line got one. I happened to be walking by as he finished. 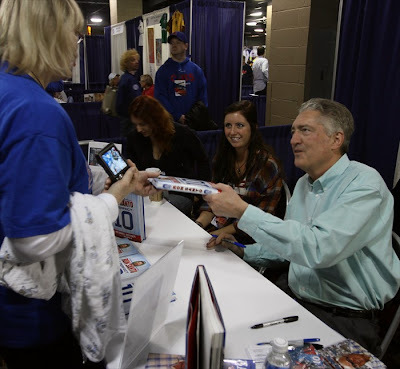 Wood walked to the exit door then stopped and again signed more autographs to the delight of fans. 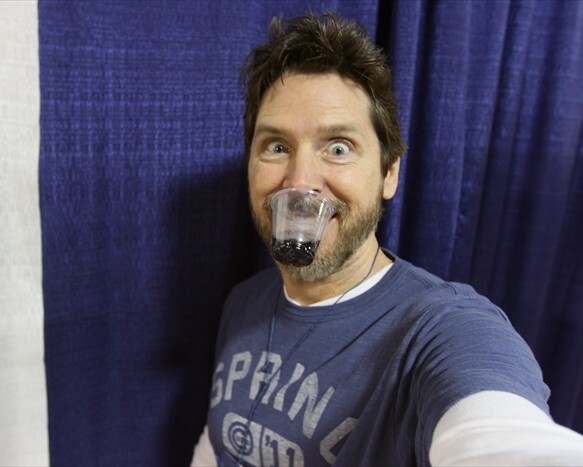 Kerry is a classy guy, a quality pitcher, and great clubhouse leader. The young players can learn much from this veteran. All in all my first Cubs Convention was an incredible experience; I look forward to going back again. However soon it’s time for the Cubs to come here. 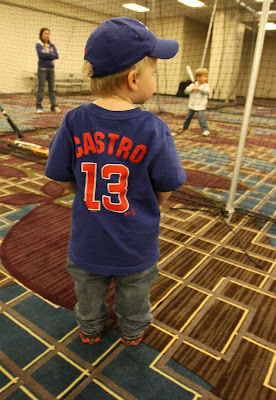 Only 33 days until pitchers and catchers report. 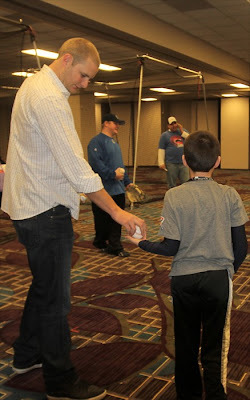 New Cubs pitcher Chris Volstad (the tall one).